I've worked on 3 projects since my last update. First up, Six of Swords with artwork by Stephanie Pui-Mun Law. I'm happy to report I finished up page 1! This is a (relatively) smaller full-sized piece. I think it has a total of 36 pages (as opposed to 94 or some insane number in A Stitching Shelf), so 1 of 36 done! I'm stitching this 1 over 1, full crosses on 25-guide Magic Guide with DMC. I then decided to tackle one of my older WIPs, The Winter Garden, with pattern by the Drawn Thread. The original supply list called for NPI and Dinky Dyes silks, but I opted for Gentle Arts and Colour and Cotton hand-dyed cotton threads and I think it turned out really beautifully. This is stitched 1 over 2 on 32-count Belfast from Wichelt in the Smokey Pearl colorway (which is the called-for fabric). It's DONE! So happy with how this turned out! Right now, to finish out this last week in June, I'm working on my Desert Mandala from Chatelaine. This shows the finished upper center landscape vignette. I'm currently working on the upper border and the bear totem section. I want to get the bear done before put this away for the month. I've got backstitching in his body left to do and the backstitching that outlines the cacti and adds in the thorns on those. 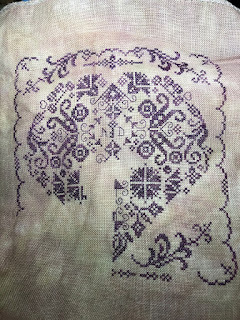 Then whatever time I have left, I'll keep working on the upper right-hand border(s). It's nice to have gotten to the upper edge of the piece so I can sort of feel like I'm now just working to complete things rather than continuing to make the piece bigger!